Santa Clara Homestead Little League has merged with Santa Clara Westside Little League. Serra Little League and Sunnyvale Southern Little League have merged to become Sunnyvale Little League. medical issues. We accept all players from ages 5 and older. WHEN and WHERE: There are over 20 Challenger teams on the west side of the SF Bay. Games are mostly on Sunday afternoons from mid-March through early June. 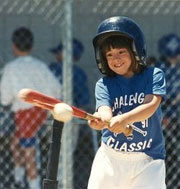 BASIC GAME RULES: In a Challenger game, each player gets a chance at bat. Usually two innings are played. No score is kept during Challenger games. as other Little League players. REGISTRATION: Fees vary depending upon each league. Registration deadline is in mid-February. SAFETY: Parents must stay at the games in case their child needs help. BUDDIES: Some leagues have Buddies to assist Challenger players on the field. Whenever possible, Buddies encourage players to bat and to make the plays themselves. However, the Buddy is always nearby to help when needed. or call/text Amy Jasper at (408) 506 2913. For general information about Little League, go to www.littleleague.org. Challenger baseball is not affiliated with any school nor school district. Challenger Baseball is a division of Little League. and the 2016 Kathy Wolff - Women in Baseball Award given by the Santa Clara Valley Hot Stove Association. We hope you will join a Challenger team. Thank you! Mark Phillips (challenger@cad44.org) spearheads/oversees the Challenger Buddy and Coaches Programs. and/or starting a Challenger Program in your league.